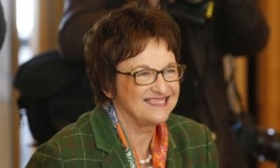 German Economy Minister Brigitte Zypries: "We have to talk, talk, talk. Such an isolationist policy, which Donald Trump apparently plans to implement, is hurting all sides -- also the American economy." BERLIN -- U.S. President Donald Trump's policy decisions are going in "a totally wrong direction," German Economy Minister Brigitte Zypries said in a newspaper interview on Wednesday, warning that protectionism would cost growth and jobs in both economies. Germany is one of the world's leading trading nations, with exports accounting for some 45 percent of its gross domestic product. The United States became Germany's top trading partner in 2015, overtaking France for the first time since 1961. Asked about Trump's first policy decisions since the new American president took office, Zypries told the Bild newspaper: "What we are witnessing over the past 10 days is alarming and irritating. This is going in a totally wrong direction." Zypries pointed out that only 10 percent of German exports were going to the United States while 60 percent went to other European countries. But a protectionist U.S. trade policy would still be "bad for the German economy and therefore also for jobs," she added. Asked about how the German government was planning to react, the minister said: "We have to talk, talk, talk. Such an isolationist policy, which Donald Trump apparently plans to implement, is hurting all sides -- also the American economy." Zypries noted that some of the trade measures which Trump announced before taking office were violating the basic rules of the World Trade Organization, without elaborating. The minister also said that a protectionist trade policy would have negative consequences for U.S. citizens since also companies on American soil were depended on high-quality, cross-border supply chains. Her comments came after the head of the BDI industry group said on Tuesday that the German economy would be badly affected if Trump pursued protectionist trade policies. Trump signed an executive order last week withdrawing the United States from the 12-nation Trans-Pacific Partnership trade deal. He has also threatened to impose a border tax of 35 percent on vehicles German carmakers import to the U.S. market. On Tuesday, Trump's top trade adviser, Peter Navarro, stepped up the pressure, accusing Germany of using a "grossly undervalued" euro to gain a competitive advantage. His remarks drew a rebuff from Chancellor Angela Merkel who said that the euro exchange rate was linked to the European Central Bank's monetary policy and that the German government had no influence on the ECB's rate decisions. Government officials have also suggested that German firms should take advantage of any trade opportunities in Asia and South America created by a more protectionist United States.